WASHINGTON — If you scrolled social media over the holidays, you no doubt heard about the new sci-fi horror flick “Bird Box,” which just set a Netflix record with 45 million subscribers tuning in to watch, the most for a first-week release in the streaming service’s 12-year history. When I first saw it trending on Twitter, I’ll admit that I expected an overhyped fad. The see-no-evil premise sounded awfully derivative of the hear-no-evil setup of John Krasinski’s “A Quiet Place” (2018) mixed with the mass suicides of M. Night Shyamalan’s “The Happening” (2008). But the more I dug into its development, the more my unoriginality doubts dissipated. Turns out, “Bird Box” is based on a 2014 novel by Josh Malerman, who wrote a draft in 2008, while “A Quiet Place” was a 2013 proof that Krasinski read in 2016. Regardless how you tally it, the timeline becomes muddled. Yes, there’s something to be said for arriving on screen first. But if you can get past the originality debate, you might actually enjoy “Bird Box” on its own terms. Adapted by Eric Heisserer, who earned an Oscar nomination for adapting the mind-blowing sci-fi masterpiece “Arrival” (2016), the film follows a single mother, Malorie (Sandra Bullock), who steers two children to safety amid an ominous presence that drives folks to commit suicide upon witnessing it. Shielding their eyes, they head downstream in a framing device that is intercut with extended flashbacks from five years earlier when the outbreak began. Bullock is a fitting choice for the lead, having already survived a runaway bus in “Speed” (1994) and a space explosion in “Gravity” (2013). Here, she doesn’t have to keep the boat under 55 miles per hour, nor does she have to contend with 3D rapids. Rather, she must overcome her fear of motherhood, a character arc that culminates with her own “Sophie’s Choice” (though you’ll wonder why she is magically wearing eyeliner while hiding under a blanket in the boat). Netflix pulled out all of the stops to surround Bullock with a deep cast: Sarah Paulson (“The People v. O.J. Simpson”) as Bullock’s sister; John Malkovich (“Being John Malkovich”) as the wise but selfish Douglas; Jacki Weaver (“Silver Linings Playbook”) as the selfless Cheryl; Lil Rel Howery (“Get Out”) as wannabe doomsday author Charlie; Danielle Macdonald (“Patti Cake$”) as the ditsy pregnant mother Olympia; Machine Gun Kelly and Rosa Salazar (“Maze Runner”) as the horny Gary and Lucy; and Trevante Rhodes (“Moonlight”) as brave love interest Tom. Corralling them all is Emmy-winning TV director Susanne Bier (“The Night Manager”), who admirably never shows the deadly spirits, a lesson taught by Robert Wise’s “The Haunting” (1963) and Steven Spielberg’s “Jaws” (1975). Instead, we hear rustling sounds amid shaking tree branches, while Bier cuts to claustrophobic point-of-view shots under the blindfold. It’s all set to an eerie musical score by Trent Reznor and Atticus Ross, the dynamic duo behind such David Fincher thrillers as “Gone Girl” (2014) and “The Girl with the Dragon Tattoo” (2011). Beyond such filmmaking techniques, the film’s occasional flaws are more script-related. Second, Howery’s dialogue as an aspiring doomsday novelist is such obvious exposition that it becomes abundantly clear that his character exists only to provide potential explanations for the supernatural. His comedic interludes felt far less forced in Jordan Peele’s “Get Out” (2017). Finally, it’s unclear why certain people are unaffected, instead becoming wild evangelists for the supernatural. There’s brief mention that they are among a group of mental institution escapees, but it’s not clear why that shields them from danger. There’s also a key arrival who sketches visions of the beings (i.e. “The Ring” or “Close Encounters”), but this never pays off. It’s hard to focus on these irrational elements when you’re this engaged. Some viewers might find the conclusion to be anticlimactic, wanting to know why the beings are attacking in the first place. I’m glad we don’t. Over-explanations can kill a movie (i.e. “The Happening”), so it’s often better to let the mystery be (i.e. “The Leftovers”). Instead, Malorie’s quest for a mythical sanctuary recalls the best of “I Am Legend” (2007) or “World War Z” (2013), while the titular birds offer an homage to the grand daddy of the genre: Alfred Hitchcock’s “The Birds” (1963). Love it or hate it, “Bird Box” represents a fascinating win for streaming content. Haters gonna hate whenever something catches fire, but it’s doubly hard when it’s a streaming flick. We’ve already seen an anti-Netflix bias rock Dee Rees’ “Mudbound,” which was snubbed for a Best Picture nod despite rivaling “Get Out” as the best-made film of 2017. Granted, “Mudbound” and “Bird Box” aren’t even in the same league — the former is an art masterpiece, the latter is mindless fun — but they’re both bellwethers in the raging battle of streaming vs. theatrical. It remains an unsettled debate as it’s impossible to know how streaming numbers might translate to big-screen box office. 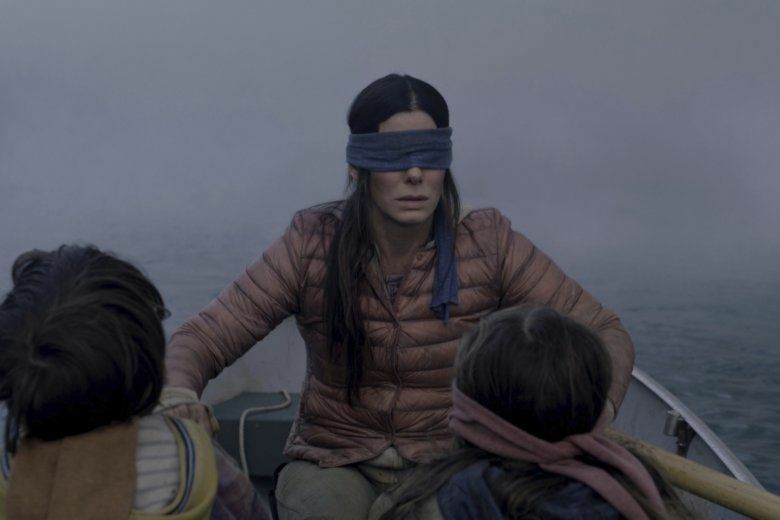 Would folks actually go pay at a theater to watch “Bird Box” rather than in their pajamas? How many viewings are “auto plays” after dozing off watching something else? And how many bailed before it was over? Netflix doesn’t provide these stats. Still, there’s no denying that “Bird Box” has become a cultural phenomenon. Your Facebook feeds are proof, as is the “Bird Box Challenge,” prompting Netflix to issue a “don’t try this at home” warning. It appears the people have spoken. So while it’s no 4-star instant classic like “A Quiet Place,” which did it first and did it better, far be it from me to nitpick a viral hit. If anything, let’s hope its success fuels arguments that “A Quiet Place” deserves an Oscar.